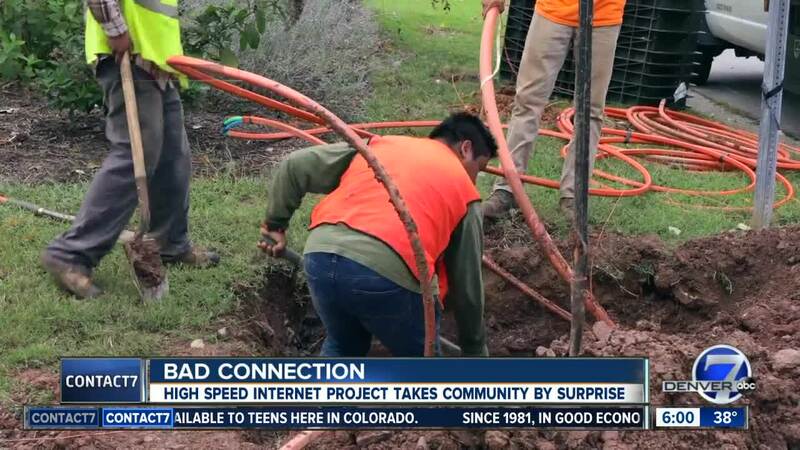 CENTENNIAL, Colo. — Neighbors in one Centennial subdivision say installation of high-speed fiber internet in their front yards was a complete surprise, and the only notice they received were from utility marking flags across their property. “I woke up to a sea for flags, and the first thought I had was, 'what's going on in our neighborhood? '” homeowner Larry Edwards said. Edwards lives in the Homestead in the Willows neighborhood, near Quebec and Dry Creek Road. He says he was never notified that the internet company Ting would be installing fiber optic cable across his property as part of the city’s fiber network plan. Ting signed on with the City of Centennial on March of 2018 to be part of the “fiber backbone” that gave high-speed access to businesses and government buildings. That agreement included allowing Ting to install its service in some neighborhoods of Centennial as well. Voters approved a ballot measure in 2013 to allow the city to “begin exploring opportunities associated with indirect, competitive, and non-exclusive service provision models that support the transmission of high-speed Internet,” according to city documents. Decisions about partnerships and agreements since then were made by the City Council. That’s part of the reason why neighbors like Edwards are upset. “We did not choose nor did we invite Ting to come into our neighborhood and to destroy the looks of it,” he said. Due to pre-existing easements for utilities allowing access to the public-right-of-way, the internet company has a right to install fiber optic lines up to six feet onto someone’s property from the sidewalk. That’s where gas and some electric lines were marked in the neighborhoods. “Not only are they going to be digging up our yards to install cable four feet parallel to the sidewalk, they’re going to be installing boxes that measure 13-inches by 18-inches,” Edwards explained. That email went on to say that the boxes that Edwards described would need to be installed at 90% of homes. “After they’re completed that's all you’re going to see, are these green boxes,” he said. The homeowners association for the Homestead neighborhood says they were just as surprised as neighbors to see the flags pop up and learn what was going to happen, and they had to be informed about what was going on from the homeowners themselves. Edwards and his neighbors say that hasn’t happened. One homeowner took a pamphlet to the HOA describing construction coming to Mill Creek, despite the fact they don’t live in Mill Creek. Further questions were directed to Ting. Questions via email to the company were not returned.